Take a virtual tour of the campus, schedule a visit with a live tour guide, or visit campus on your own. 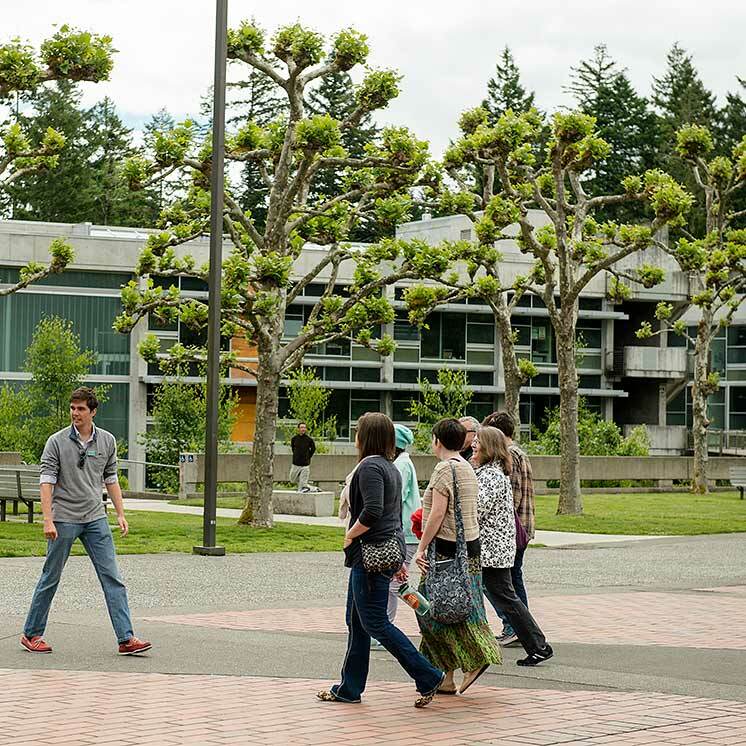 Take our Virtual Campus Tour to learn all about Evergreen in an interactive way. Or visit Evergreen with Google Street View. Arrange an on-campus tour to see our beautiful campus in person. Tour the campus, talk to students, and sit in on a class. Get to know what it's really like to be a Greener and imagine yourself living and learning here. One of our student ambassadors will lead the way. 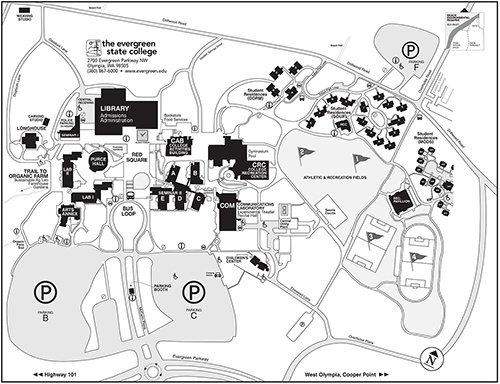 Get maps and easy-to-follow directions to reach Evergreen by car or public transportation. An hour south of Seattle-Tacoma International Airport, Evergreen and the state capital are a short, scenic drive from most Western Washington cities and major points of interest. Get information about parking and rates. We have several on-campus parking lots that will get you close to the places you need to be. Parking is enforced Monday through Friday, 7 am – 9 pm. See all that Olympia and the surrounding area has to offer. There are many things to do and see both on-campus and beyond: a local music scene, recreation, trails, attractions… even a beach or two! There are a number of hotels and motels near the college. Google has a map of nearby places for an overnight stay. You may also want to browse Yelp for reviews. Some places may offer discounts for Evergreen visitors, so be sure to ask! The drive from downtown Olympia to Evergreen takes about 20 minutes. If you’re coming to campus regularly, there are a number of benefits to alternative transportation: save money, reduce air pollution, traffic congestion, and energy consumption, and lower stress. Learn more about the benefits of commuting by bike, bus, carpool, and more.